Initially teased earlier this month, news has now surfaced on the official launch of the forthcoming atmos x Nike LeBron 16 Low. The “Safari” iteration was initially seen on the feet of LeBron James during this year’s All-Star weekend. The model’s original Battle Knit is swapped out for a selection of layers with the popular “Safari” print on its mudguard. Other layers include suede and a rippled neoprene towards the ankle entry. The aforementioned orange upper is complemented by black accents on its laces and zipper closure that runs down the tongue. Lastly, you’ll find Nike insignias throughout the sneaker with a mini Swoosh atop the mudguard and mismatched Swooshes on each tongue. 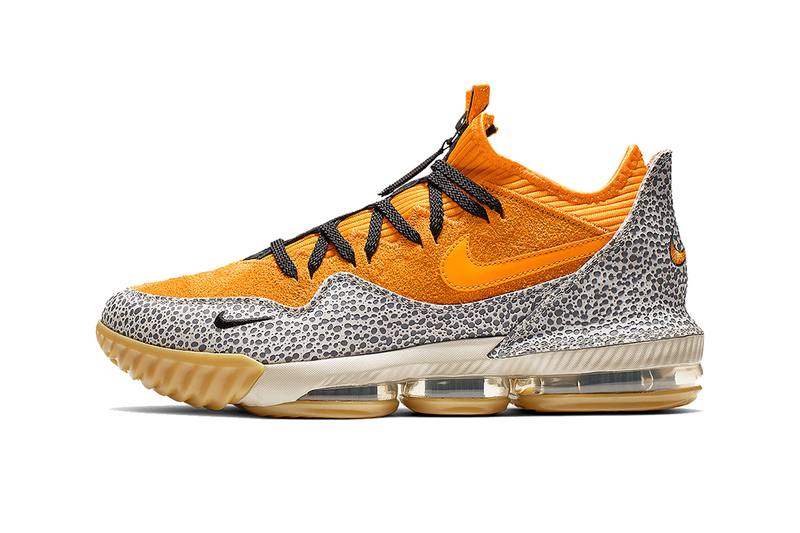 The atmos x Nike LeBron 16 Low “Safari” arrives March 2 for $175 USD at select Nike Basketball stockists and Nike SNKRS. Fans of King James can also take a look at the Arthur-themed LeBron Soldier 12. Nike Combines OG Detailing & Modern Designs on the LeBron 16 "Remix"